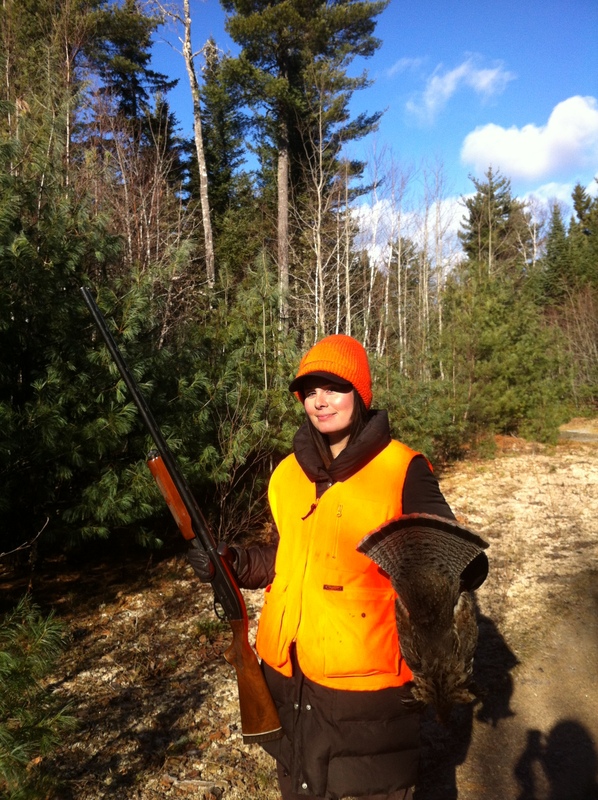 Last Saturday morning I got up, checked the weather, checked my hunting calendar and remembered that it was the second last weekend of the 2013 grouse season in New Brunswick – likely the last without a major snowfall. Outside it was a beautiful, brittle November day. The thermometer read -9°C, there was little-to-no wind, and the forecast called for sun all day — perfect grouse hunting conditions. I knew there would be a thick frost; we’d had 100mm of rain on Wednesday. My girlfriend, Maggie and I had planned to go hiking however – with a little convincing – I was able to persuade her into combining the two activities. Who wouldn’t want a nice grouse for supper? We hit the road around 9:30am – heading for some public land about 20 minutes south of Fredericton. I was looking for a nice softwood (coniferous) forest, preferably with some pine. This late in the year – in the absence of herbaceous vegetation – grouse introduce pine needles and/or buds into their diet. This dietary change impacts the taste of the meat – it’s supposed to become gamier – but this doesn’t bother me. After arriving at the hunting grounds and topping off our clothing layers with some hunter’s orange, we set out on foot down an old ATV trail. I was carrying my faithful Remington 870 Wingmaster, and Maggie was unarmed – which was probably for the best. Our objectives were to hike up a hardwood ridge into my deer stand – a story for another day – and check my game camera. After which we planned to head back down to find some softwood and maybe some running water. Thankfully, back in September, a friend and I had forged a nice little trail that provided direct access – up a major slope – to my blind. So up we went. I tried to be a gentleman. I tried to break every branch at face level in order to protect Maggie from being whipped in the face. But I realized I couldn’t get them all. I think Maggie was starting to question my decision to turn this into a hunting expedition. “I thought you said this was a trail,” she uttered while feeling her face for scratches. Things were inexplicably quiet, the magic hour — 10:00am — had come and gone and we hadn’t seen or heard a thing. We were content with not seeing anything; it really was a beautiful day to be in the woods — the chickadees, nuthatches, and woodpeckers were out in full force. I think it was a hike more akin to what Maggie had in mind. 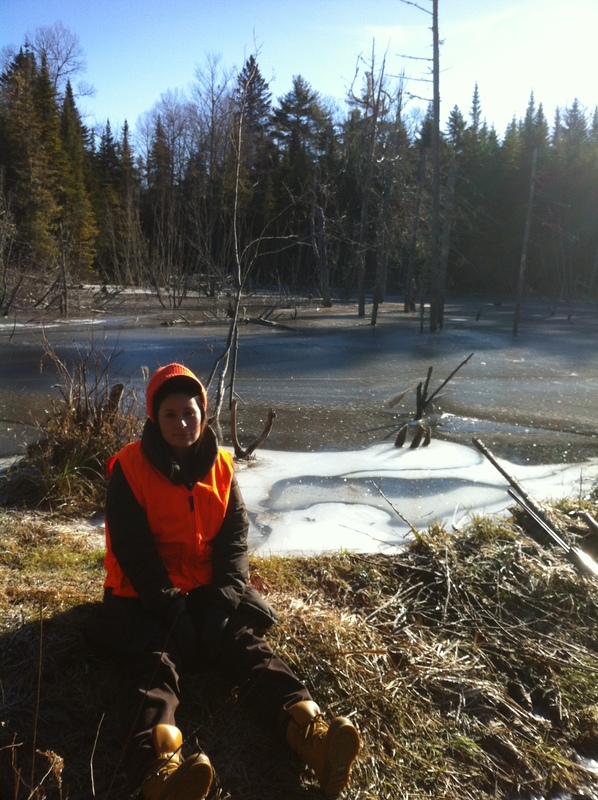 We approached a frozen beaver pond chatting away – not paying attention to the trail ahead – when a grouse fluttered up and across the trail and landed in a thicket of tall, dense balsam fir. I attempted to make chase, but the wall of fir stems was nearly impenetrable. Eventually I found an opening and slid in amongst the slender trees. I quietly stalked in the direction I thought the bird would have gone hoping for a second glance. Sure enough I caught up to the bird as it was walking through a thicket about 15 yards away. I pressed myself up against a tree and waited for a clear shot. Unfortunately, the bird grew wise to my presence when I accidentally broke a branch. I could see that it was about to take off so I stepped out and took aim. I took a shot through the thicket as it flushed, but it wasn’t meant to be. The bird sailed away across the beaver pond, earning its freedom. I returned to the trail empty handed. Maggie was ready to head back – we’d already walked several kilometers – but I convinced her that we needed to investigate what was around the next corner first. Several corners later – in a red pine stand – we heard the familiar sound of rapid shuffling on the forest floor. I wheeled to the left and sure enough a ruffed grouse was running through the understory. I quickly raised my Remington 870 Wingmaster, aimed about eight inches in front of the bird, and pulled the trigger. With the sound of the wings flapping against the ground, I looked over at Maggie, and knew it was time to go. After a couple staged photos. 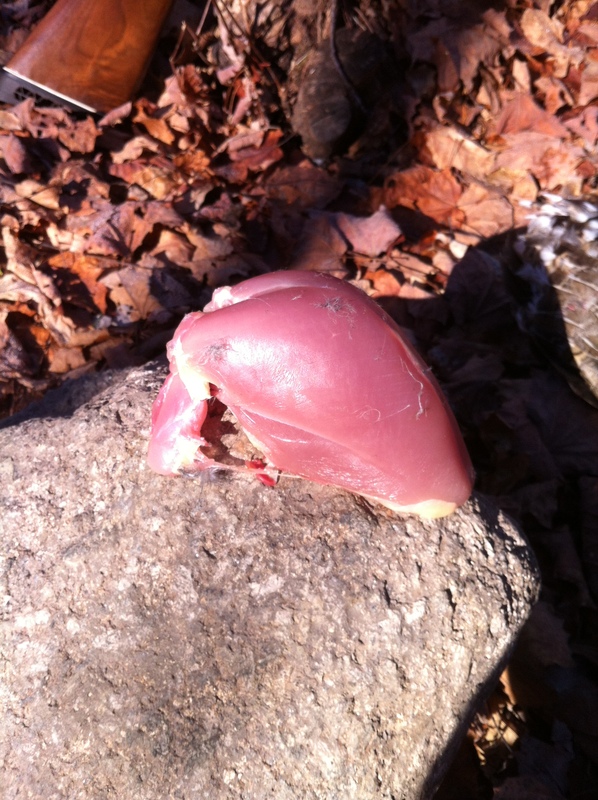 As I cleaned the bird back at the trailhead, I thought it might be interesting to open up the crop and look for a little evidence of the dietary change. Sure enough the crop was full of pine needles and unidentifiable buds – my guess was birch. I reflected upon the season that was. It was a memorable year, with some near misses and – of course – some complete misses.